The Cotterman Series 6500 disassembles easily and folds into itself for easy transportation or storage. The rear casters are 10" diameter solid rubber wheels. The front end rests on legs with rubber pads. Cotterman Safelock caster system is available on all models for an additional charge. Climbing angle is 59 degrees. The ladder is powder coated with high gloss powder. Pick your color from our 11 stock choices. The steps are 7" deep, with the top step being your choice of 10" or 20". 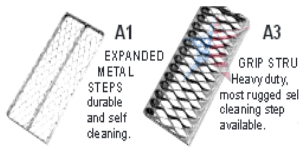 Tread selections are expanded metal mesh or Grip Strut for heavy industrial environments. The load rating is 300lbs. • Rigid 1" O.D. 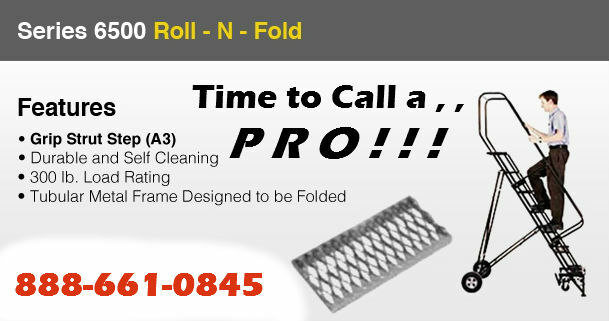 tubular frame is designed to be folded. • Large 10" diameter ball bearing solid rubber wheels are mounted on heavy" axles. top step is 10" deep and 16" wide, and E4-20 is 20" deep and 16" wide. and light gray are available. 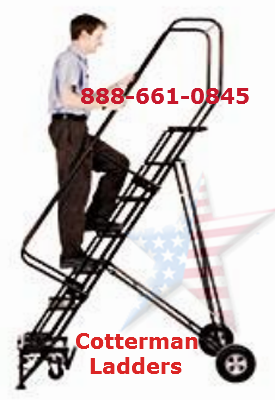 • Series 6500 ladders comply with OSHA 1910.29 and ANSI A14.7 standards with a 300 lb. load rating. • Safe lock standard on 10-16 steps. 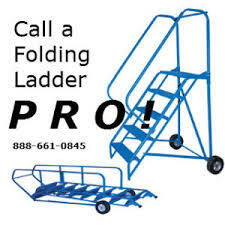 Fold-n-Store Rolling Ladders offer safety and more flexibility compared to conventional fixed ladders. Our folding ladders are very easy to carry and can be used almost anywhere. transferring it from one work area to another is easy. They are versatile and may be used for any type of work.